The inside of this (as usual, always Geologically speaking) "young", Unnamed Mercurian Rayed (of course, the Rays are not visible in this frame) Impact Crater is seen at a resolution of just over 5 (five) meters per pixel. 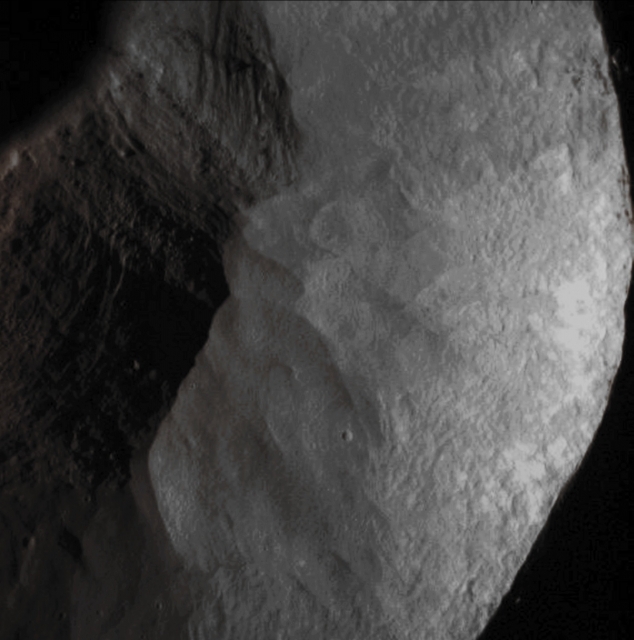 The Walls of this Crater appear smooth where Rocky and, in particular, Dusty Materials flowed downhill and come to rest on the Crater's Floor, in a jumble (---> confused amount) of Boulders and other Fragmental Debris. This picture (which is an Original NASA - MESSENGER Spacecraft's b/w and NON Map-Projected image published on the NASA - Planetary Photojournal with the ID n. PIA 19260) has been additionally processed, contrast enhanced, Gamma corrected, magnified to aid the visibility of the details and then colorized in Absolute Natural Colors (such as the colors that a human eye would actually perceive if someone were onboard the NASA - MESSENGER Spacecraft and then looked outside, towards the Surface of Mercury), by using an original technique created - and, in time, dramatically improved - by the Lunar Explorer Italia Team. Different colors, as well as different shades of the same color, mean, among other things, the existence of different Elements (Minerals) present on the Surface of Mercury, each having a different Albedo (---> Reflectivity) and Chemical Composition.